In the Garden of Eden, "the Lord God commanded the man, saying, Of every tree of the garden thou mayest freely eat: but of the tree of the knowledge of good and evil, thou shalt not eat of it: for in the day that thou eatest thereof thou shalt surely die" (Genesis 2:16, 17). 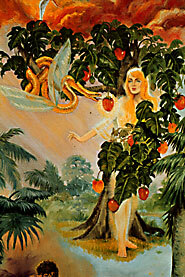 Eve was deceived by the serpent and disobeyed the clear instructions of God. Adam also ate the fruit and both became separated from God. "Sin is the transgression of the law," therefore death and decay became the lot of all children of Adam and Eve. Through His divine love, Jesus the Redeemer, the mighty God, the everlasting Father, "For unto us a child is born, unto us a son is given: and the government shall be upon his shoulder: and his name shall be called Wonderful, Counsellor, The mighty God, The everlasting Father, The Prince of Peace" (Isaiah 9:6) condescended to come to this world took on human nature to redeem man and bring him once again in harmony with God. Jesus became the bridge back to God. If man will by faith accept the sacrifice of Jesus on the cross as his substitute death, he can then once more become a child of God. During Jesus' life on this earth, He performed mighty miracles, and the greatest of them all was to bring Lazarus back to life after being dead for four days. Jesus said Lazarus was asleep and He was going to wake him up. Jesus called death "sleep." Why? Because those that are asleep will eventually wake eventually up when Jesus returns to the earth. "I am the resurrection, and the life," Jesus said to a mourning Martha. "Jesus said unto her, I am the resurrection, and the life: he that believeth in me, though he were dead, yet shall he live" (John 11:25). This statement assures Christians throughout the ages that they also will be resurrected and awaken from their dusty beds, if they put their trust in Christ. In Daniel 12:2 it refers to persons sleeping "in the dust of the earth" or the grave. At death, all righteous and wicked alike, go to the same place, according to Ecclesiastes 3:20 "All go unto one place; all are of the dust, and all turn to dust again." Also read Job 14:2, "His sons come to honour, and he knoweth it not; and they are brought low, but he perceiveth it not of them." Ecclesiastes 9:10, "Whatsoever thy hand findeth to do, do it with thy might; for there is no work, nor device, nor knowledge, nor wisdom, in the grave, whither thou goest." Psalm 146:4, "His breath goeth forth, he returneth to his earth; in that very day his thoughts perish." The Psalmist says that the dead do not worship God, they are unconscious, just as a sleeping person does not know what goes on around him or her. The dead do not continue living "somewhere," they are fully unconscious. "Behold, I shew you a mystery; We shall not all sleep, but we shall all be changed, In a moment, in the twinkling of an eye, at the last trump: for the trumpet shall sound, and the dead shall be raised incorruptible, and we shall be changed. For this corruptible must put on incorruption, and this mortal must put on immortality. So when this corruptible shall have put on incorruption, and this mortal shall have put on immortality, then shall be brought to pass the saying that is written, Death is swallowed up in victory. O death, where is thy sting? O grave, where is thy victory?" (1 Corinthians 15:51-55). "The last enemy that shall be destroyed is death" (1 Corinthians15:26).